Need a quick review of what took place in today's match? See the two minute highlight, powered by Suzuki below. Want to see more? Here's the extended version! 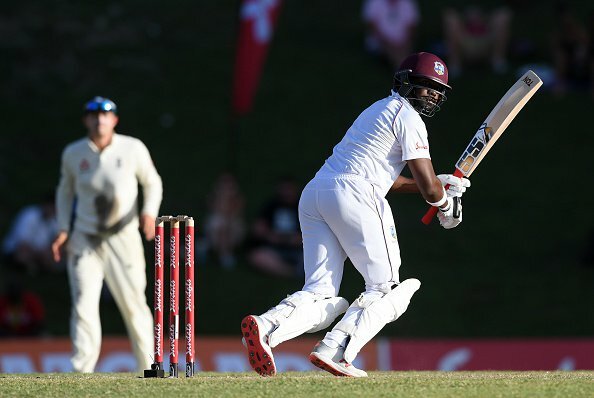 ST. JOHN’S, Antigua – Darren Bravo drew on all the skill and experience he has gained in his 51 Tests to be the embodiment of the resolve shown by the WINDIES batsmen, as they defied a persistent England attack in difficult conditions to earn a hard-fought, first innings lead in the second Test on Friday here. 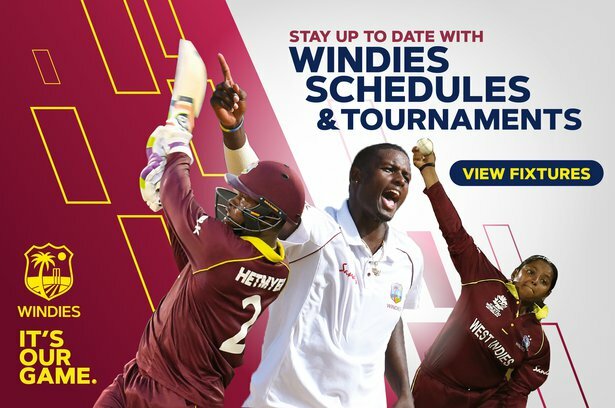 Bravo, playing only his third innings since his return to the side following a near two-year absence, was not out on 33 and WINDIES captain Jason Holder was not out on 19, as the home team reached 272 for six in their first innings at the close on the second day of the Test, for a lead of 85. Coming to the crease following the dismissal of Kraigg Brathwaite, whose typically gritty 49 set the tone for the innings and has been the top score so far, the typically enterprising Bravo showed great restraint in more than four hours at the crease to help nurse the WINDIES into the lead. But he was fortunate on 20, when it appeared Jos Buttler dropped him at second slip off Stuart Broad shortly after tea and he also endured a blow to the forearm by a delivery from the same bowler that rose sharply from the unpredictable Vivian Richards Cricket Ground pitch. Bravo shared a valuable 50-run stand for the sixth wicket with Shane Dowrich and spent nearly an hour and a half with Holder to put on 36 – unbroken – for the seventh wicket to ensure the visitors spent the entire day in the field. Starting the day on 30 without loss, the WINDIES, with some good fortune, controlled the opening session to reach 126 for one at lunch. Rookie left-handed opener John Campbell lived a charmed life for his 47, as he extended his first-wicket stand with Brathwaite to 70. In a challenging first hour, mainly against Broad, Campbell twice suffered reprieves on 21 before he fell just short of his maiden Test half-century. First, he was adjudged caught at first slip off Broad, only for the subsequent review to show the ball clipped his elbow. And in the next over from Broad, Campbell stabbed at a delivery that left him only for Jos Buttler at third slip to grass a straightforward chance. He survived to count five boundaries off 118 balls before Buttler finally held on to a catch at second slip off Ben Stokes’ second over of the morning, nearing the hour mark. 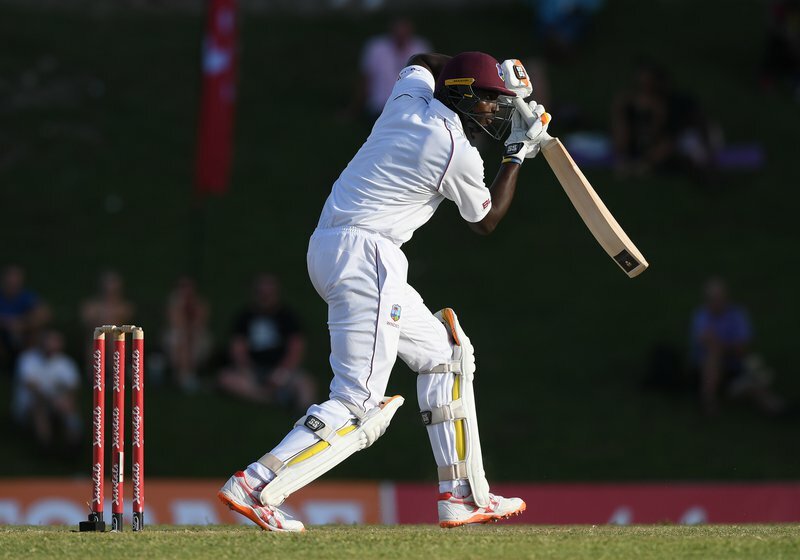 Brathwaite grew in confidence after again starting slowly and with Hope batted through the remainder of the session to put the WINDIES within sight of the lead. 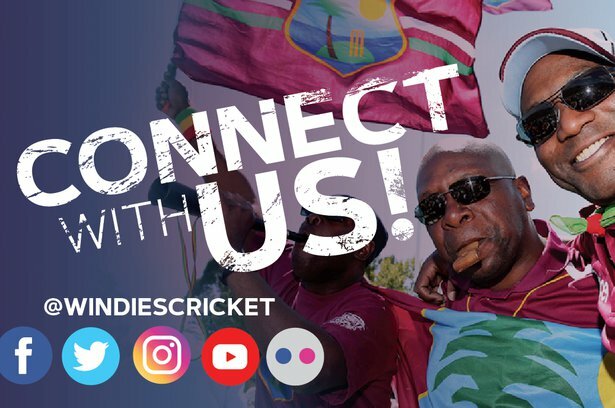 Hoping to build on their position after lunch, the WINDIES were set back when they lost four wickets and stumbled to 212 for five at tea. Brathwaite fell in the third over following the interval, when he was caught at short leg off part-time off-spinner Moeen Ali. 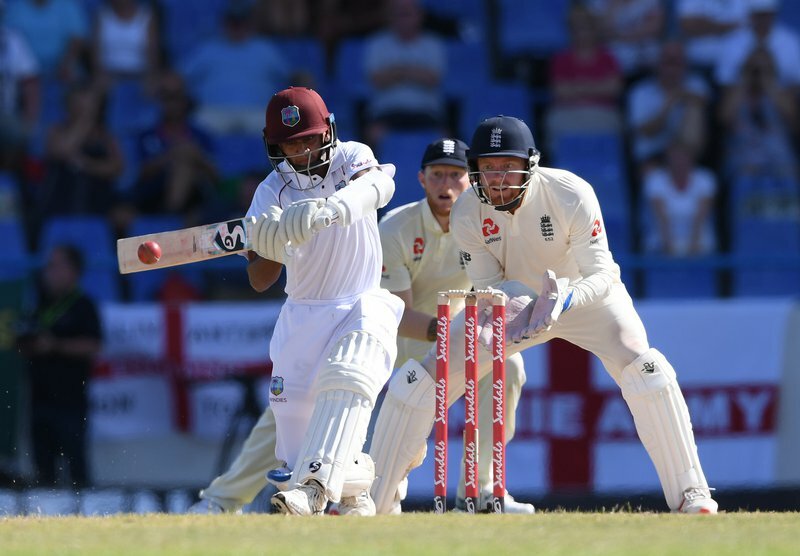 Shai Hope with whom Brathwaite added 63 for the second wicket made 44, striking five fours in an attractive 64-ball innings, before he was caught behind in a drama-filled over from Broad that also saw Roston Chase bowled off-stump three balls later for four by a delivery that kept low. Shimron Hetmyer hit a typically entertaining, but all-too-brief 21 off 35 balls before he was caught by Jimmy Anderson running in from the long-off boundary off Ali. But Dowrich and Bravo continued the grind for the WINDIES and brought back stability before the irrepressible Broad broke through again. Dowrich had looked untroubled for his 31 and handled the variable bounce of the pitch admirably until a delivery from the beanpole fast bowler leapt sharply and he gave a catch to second slip. Holder, fresh from his epic double-hundred in the first Test in Barbados, came to the crease and batted through the remainder of the day to further frustrate the visitors. Loving the cricket? 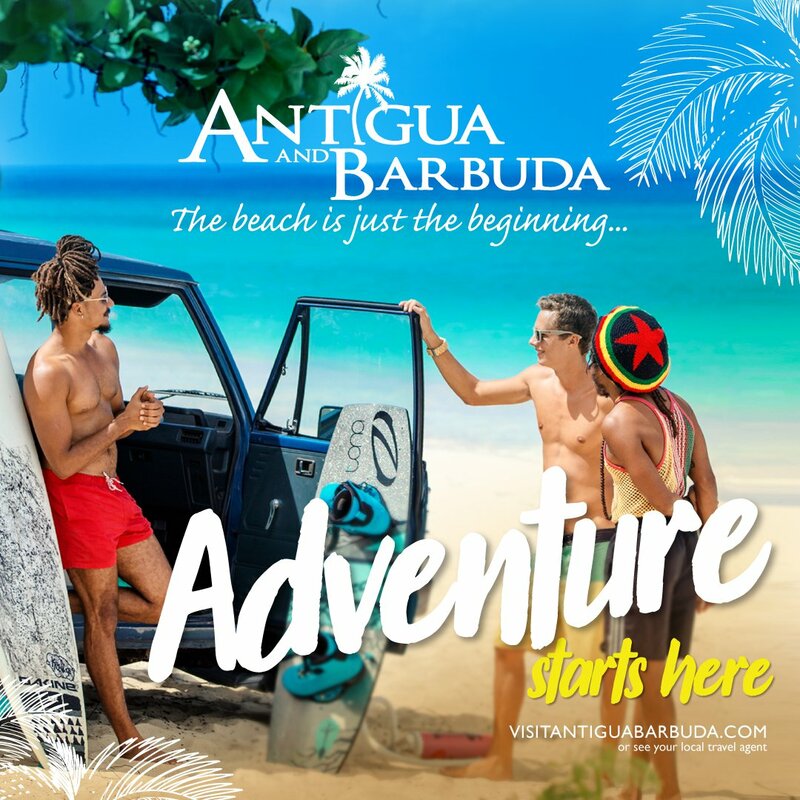 Give some more of the activities in Antigua a try! Cricket is just the beginning.